When people think of self defense, visions of flying crouching tigers and hidden dragons, dancing from bamboo stem to bamboo stem, wielding deadly weapons to whoosh enemies out of existence, often comes to mind. However, self defense encompasses many aspects, not just in the physicality a la Karate Kid, or what’s mirrored in movies. As a woman who has learned Filipino Weapon Fighting, mainly to combat street harassment in New York City, I have learned that being able to defend oneself comes in many forms: physical, verbal, mental, and spiritual. It takes time to master many forms, techniques, and mindsets that alter your perceptions of a potential attack. Don’t allow yourself to be silenced. 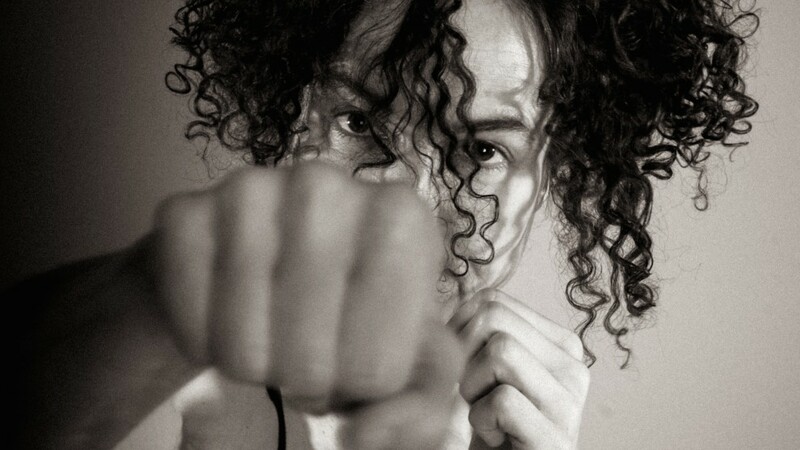 Verbal self defense is especially important for women. “giudith’s silence” by silviadinatale©, used with permission under CC BY 2.0. Source. I have taught basic self defense workshops. And one thing I notice is how the female participants don’t always realize they have the option to verbally defend themselves. But, once I teach them to yell “No!” from deep in their gut, instead of their throat, it’s like they’ve all found a new toy they want to play with! For women, learning to stand up verbally for ourselves is a key tool, since we have often been raised not to do so. 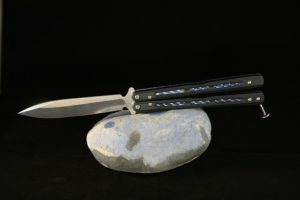 The balisong, my initially most feared, but, now, most favorite, weapon. Spiritually, it is necessary to build up your reserves, to discipline the mind, since lots of times, we are our own worst enemy. It is a constant work in progress. But, over the years, martial artists have realized that “building Qi”, or building up the energetic life force within oneself, is tantamount to success as a warrior. Some forms that build Qi include Tai Qi and Qi Gong. Meditation is another component to silencing the monkey mind we all have, that part of our mind that swings from one topic to the next, creating unrest and confusion. It is meditation that brings clarity, and seats ourselves into a more present lifestyle. And, yet, another, and equally important, form of building Qi and maintaining the body is acupuncture. Acupuncture has been used for at least 2,000 years by those who trained themselves in the arts, to build their Qi, boost their immunity in harsh environmental and physical conditions, maintain their health in order to be at top shape at all times, and even to heal martial arts related injuries (there are many soaks, rubs, liniments, patches, poultices, and such, that have been created just for that.) Tui Na is healing modality that includes Chinese Medical Massage, which is a tool acupuncturists use to help break up stasis, and encourage blood flow to the injured area. Back in the day, and in some select settings, still, acupuncturists even do bone setting, for when it’s been way active in the dojo! 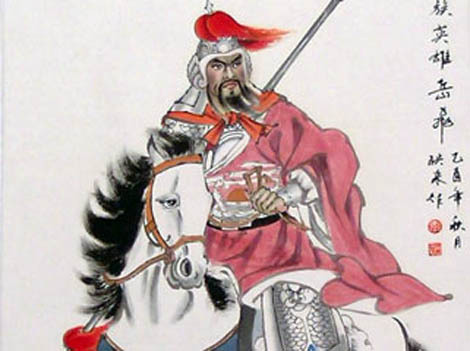 Ancient Chinese Warrior Yue Fei (1103 – 1142 A.D.) I’m sure he ate his Wheaties and got acupuncture treatments regularly. Photo by Kaleidoscope Culture-China. So, as you see, acupuncture is much more than a hip luxury to be experienced in a spa-like setting. It is part of the greater, vital whole in keeping oneself on top of their game, to keep qi at an optimum level, and a form of self defense. Copyright © 2011 by Alcantara Acupuncture & Healing Arts. All rights reserved. You may quote, copy, translate and link to this article, in its entirety, on free, non-donation based websites only, as long as you include the author name and a working link back to this website. All other uses are strictly prohibited. Really great Post Margarita! Going to post a link to it on my blog if that’s ok. I think my patients would really benefit. Thanks for enjoying my post, and please feel free to share it on your blog! The picture of your clinic looks so inviting, and your picture of Miss Pig put a smile on my face. I hope all is well in Portland.